The poll showed that sustainability took a number of different forms in landscape design. 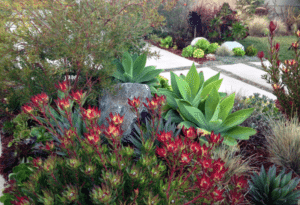 Including drought–tolerant and native plants that require less water or special care were two sustainable options that the landscapers noted in 8 out of 10 designers. Reduced lawn area was another strong trend noted by 72% of respondents. Another way that 75% of landscape architects noted to make your yard a sustainable one is to include vegetable gardens, vineyards or fruit trees that can provide your family and community with homegrown food. These types of landscapes offer another great benefit— freeing up more time and energy to enjoy your home’s gardens and surrounding greenery! Making your outdoor spaces easier to enjoy year round was another trend on the uptick. Outdoor spaces provide gathering places, play areas for children and areas for healthy activities of all kinds. Landscape architects note that outdoor design elements are taking the form of seating and dining areas, outdoor furniture and fire pits and fireplaces. 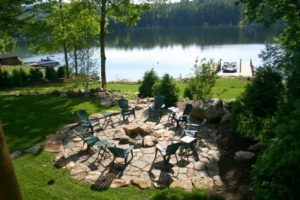 These entertainment areas add value to your home and can be accomplished with grading and terracing, hardscaping, decks, and beautiful stonework. Many homeowners are incorporating outdoor kitchens, fireplaces and patios for year round entertaining outside. Harvesting rainwater or recycling graywater was the top trend noted by nine out of ten landscape architects. The interesting difference is that now rainwater collection barrels are no longer functional black plastic barrels to be hidden away, but active design elements within landscapes. Stone clad cisterns and beautiful handcrafted wood rain barrels provide functionality as well as visual interest to outdoor areas. 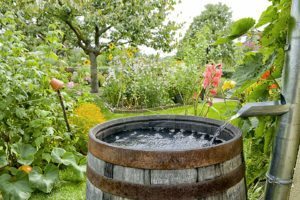 Water features are still popular in landscaping, but rather than a pond or fountain, many homeowners are opting for rain gardens. These plantings feature wetlands-tolerant vegetation that help to filter storm water and provide natural drainage for low areas in a lot. Many designers (72%) are opting for high efficiency drip irrigation systems for garden beds and reduced lawn areas. Another area that helps to mitigate storm water issues include permeable paving, noted by three quarters of the architects surveyed. Whatever your plans for landscaping design, it may be worthwhile to consult with a landscape architect to see how these trends might be included in your new Katahdin Cedar Log Home!